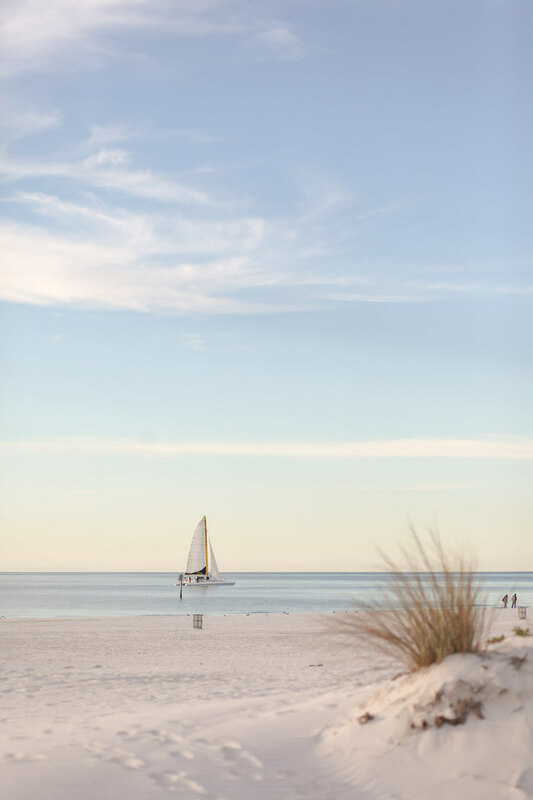 Bohemian elegance and natural elements inspired this Tampa Bay beachfront styled shoot at Clearwater Beach wedding venue the Hilton Clearwater Beach. The day began with an oceanfront, beach wedding ceremony featuring a rustic, wooden arch adorned with greenery and blush pink roses. The romantic wedding flowers continued down the aisle with a rose petal carpet and organic inspired chair decor. 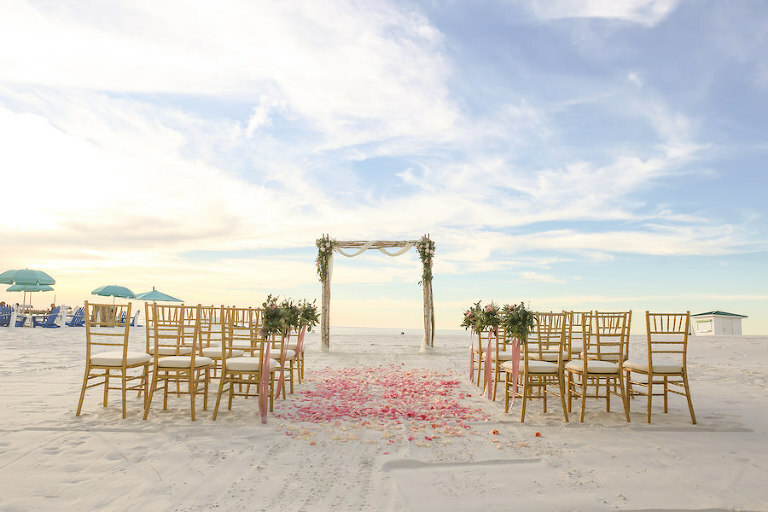 The gold chiavari chairs from Signature Event Rentals added an elegant touch to the beach ceremony. While the bride and groom took sunset wedding portraits, guests enjoyed the beautiful beach views with an outdoor cocktail hour decorated with gold chiavari barstools and cocktail tables, dressed in blue linens with pink sashes from Over the Top Rental Linens. The Clearwater Beach wedding reception took place just steps from the beach on the Hilton’s outdoor Flamingo Deck with market lights creating an inviting atmosphere. “Their deck is a one-of-a-kind and unique waterfront ballroom on the beach; it’s rustic wood pilings combined with the amazing views are what couples are looking for,” Izabela gushed. The gold and blush pink color palette continued into the reception decor, with long feasting tables featuring navy blue burlap linens and gold chiavari chairs with pink sashes. A Chair Affair accented with boho chic decor with white and gold china and gold flatware. The beaded glass chargers from Signature Event Rentals tied the look together by adding subtle touches of gold, without be too overpowering. The organic, boho elements were present in the greenery and white and pink floral wedding centerpieces. “We simply couldn’t resist the beauty of seasonal greens and the fragrant eucalyptus used in the garland; it brought a luscious look to the reception,” Izabela beamed. “My absolute favorite element of the shoot was the stunning garland table runner. There are so many different types of flowers and greenery woven into the garland; it is truly a work of art,” Courtney added. 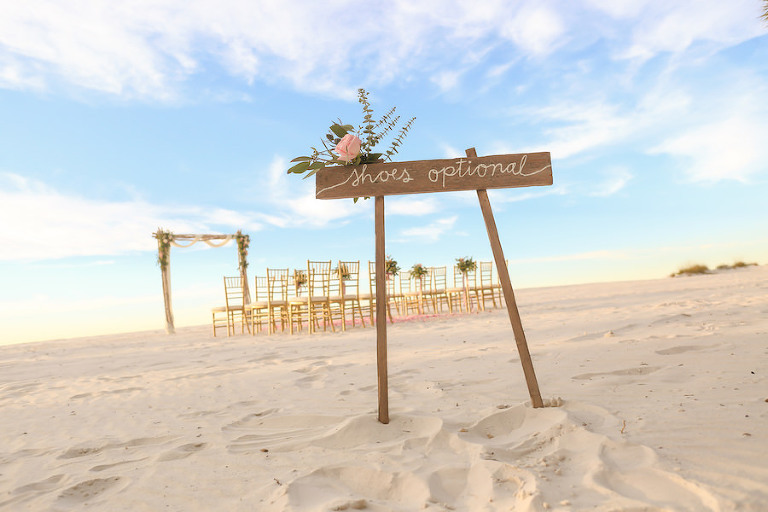 Many beach brides turn automatically to turquoise and coral, so we wanted to show that other colors can be used for a beach wedding and still have the beachy feel. 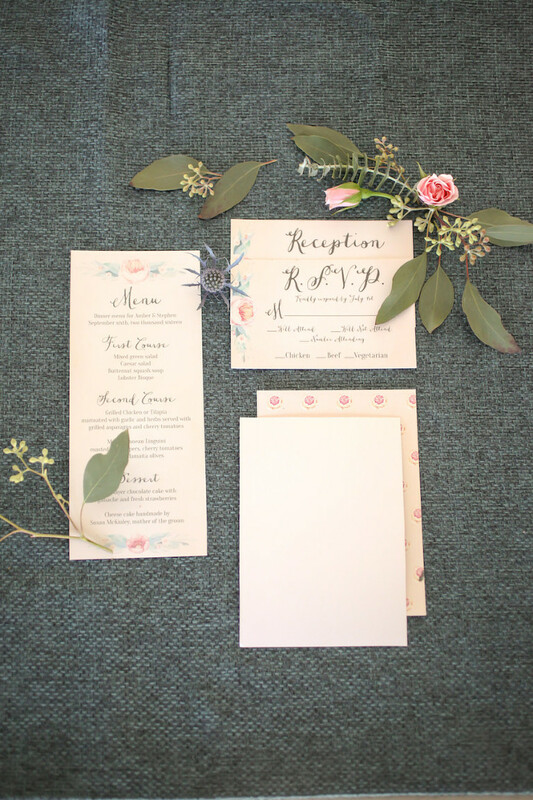 The combination of the two fabrics from the slate blue burlap tablecloth and the blush satin chair sash created a beautiful “soft versus rough” contrast. By chance, blue and pink were the Pantone colors of the year. Venue with Food and Beverage: $26,000 inclusive | Photography: $2,500 | Ceremony Decor: $1,000 | Chiavari Chair Rentals:$975 | Linens: $750 | Garland Table Runner and Centerpieces: $500/per table | Bride’s Bouquet: $250 | String Lights: $535 | China, Glassware and Silverware: $1,000 *This is only an estimate to assist you in budgeting for your wedding.